18 to 110 mm* zoom covers the most frequently used range for Super 35/APS-C movies with a constant F4 maximum aperture. G Lens optical performance delivers image quality that is suitable for 4K production throughout, right out to the image periphery. Sony SMO design minimizes image shift due to lens operation, while high-level zoom control and refined focus add to professional overall performance. An 18~110 mm powered zoom for Super 35/APS-C moviemaking, with constant F4 maximum aperture. 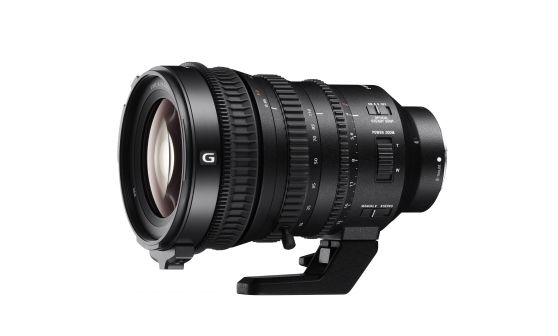 G Lens optics deliver high resolution that is ideal for 4K production. This powered zoom lens delivers optimum performance in Super 35/APS-C moviemaking applications, starting at 18 mm wide-angle and extending through an impressive 6.1x zoom range with a constant F4 maximum aperture. G Lens optical performance delivers image quality that is suitable for 4K throughout the zoom range, right out to the image periphery. Sony’s original SMO (Smooth Motion Optics) design and construction minimizes optical shifts that can have a negative impact on movie quality. Focus breathing is minimized by an internal focus mechanism, focus shift is eliminated by precise focus tracking adjustment, and axial shift is minimized by a constant-length design. In addition to smooth powered zoom, mechanical manual zoom ensures control with no lag. The desired angle of view can be accurately reached without overshoot or undershoot. Zoom ring direction can be easily switched as required, smooth, slow powered zoom is supported, and an inner zoom mechanism means that the lens’s length remains constant. Compact, lightweight design contributes to the kind of mobility that active movie shooting demands. Small size and low weight can be advantageous when using gimbals and other types of support too. * Not guaranteed to be 100% dust and moisture proof. Discover all the inside details and FAQs on our stunning FS7M2 4K camcorder.